General Motors announced new cash incentives for the Chevrolet Volt in early June and those offers paid off big time – as the Volt posted its best sales month of the year which allowed the electric Chevy to beat the Nissan Leaf in monthly sales while also pulling into the lead in total 2013 EV sales. The Nissan Leaf had lead the Chevrolet Volt in monthly sales in each of the past three stanzas but with the big cash incentives and new financing deals on the Volt, GM’s extended range electric vehicle came storming back – outselling the Leaf by better than 400 units. This breaks the Leaf’s three month streak of monthly sales titles after the all electric had only lead in sales in two months during all of the 2012 calendar year. The Chevrolet Volt posted its best year in June 2013, moving 2,698 units with the help of the new $4,000 cash rebate or a handful of 0% financing deals. 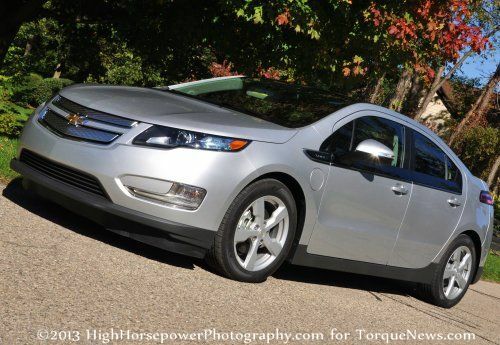 June was the best month of 2013 for the Volt with the previous best being 1,626 units sold back in February. In fact, June 2013’s sales total for the Volt is the best month extending back to October 2012 when GM sold 2,961 extended range electric sedans. While GM was busy selling more Chevy Volts than they had in any other month this year, Nissan posted the second best ever sales month for their all electric Leaf with 2,225 units sold – falling just short of the record of 2,236 set back in March. Leaf sales have been very strong since March when the consumer interest spiked from the poor first two months of 2013 and with Volt sales being low during that same time period, the Leaf claimed easy wins in March, April and May but with the big surge in Volt sales – Nissan found themselves dropping to second in monthly sales. Even worse for Nissan, the strong sales month for the Chevrolet Volt in June allowed GM to reclaim the top spot in the battle for the electric vehicle segment. GM has sold 9,855 Volts through the first half of 2013 compared to the 9,839 Nissan Leafs sold during the same period of time so while the Volt has just a very slim lead – it has a lead nonetheless. Fortunately for GM, this was the point in time in 2012 where Volt sales really began to take off and in relation to the early summer months, the fall months have historically been very strong in terms of Volt sales. Should that trend continue, GM could be looking at record numbers through the second half of the 2013 calendar year while Nissan is faced with finishing second to the Volt in annual EV sales once again. In addition to the deep incentives on the Chevrolet Volt that come in the form of cash rebates and 0% financing deals, dealerships themselves are working to spur Volt sales with reports of discounts as big as $8,000 off of the MSRP of the electric Chevy. On the other hand, Nissan has lowered the price of the Leaf in order to improve sales but with a continuing sales limitation due to production constraints, Nissan may not have the “wiggle room” with pricing that the GM dealerships enjoy.